AUD 1,454 Excl. Duties / Taxes. This Marquise diamond is 0.79 carat in weight, and comes with Good polish and Fair symmetry, as verified from an independent gemological laboratory. The diamond is graded M in colour, and has a clarity grade of SI2. The diamond's GIA grading report number is 2195667733, which will detail further its specifications and measurements, and will also come with the purchase of the stone. This Marquise diamond is 0.9 carat in weight, and comes with Excellent polish and Very Good symmetry, as verified from an independent gemological laboratory. The diamond is graded M in colour, and has a clarity grade of SI1. The diamond's GIA grading report number is 6312345424, which will detail further its specifications and measurements, and will also come with the purchase of the stone. This Marquise diamond is 1.18 carat in weight, and comes with Good polish and Fair symmetry, as verified from an independent gemological laboratory. The diamond is graded M in colour, and has a clarity grade of VS2. The diamond's GIA grading report number is 5191805781, which will detail further its specifications and measurements, and will also come with the purchase of the stone. AUD 11,249 Excl. Duties / Taxes. This Marquise diamond is 2.37 carat in weight, and comes with Good polish and Good symmetry, as verified from an independent gemological laboratory. The diamond is graded M in colour, and has a clarity grade of VS1. The diamond's GIA grading report number is 6197953059, which will detail further its specifications and measurements, and will also come with the purchase of the stone. AUD 1,559 Excl. Duties / Taxes. This Marquise diamond is 0.82 carat in weight, and comes with Good polish and Good symmetry, as verified from an independent gemological laboratory. The diamond is graded M in colour, and has a clarity grade of VS2. The diamond's GIA grading report number is 5256006868, which will detail further its specifications and measurements, and will also come with the purchase of the stone. This Marquise diamond is 1.3 carat in weight, and comes with Good polish and Good symmetry, as verified from an independent gemological laboratory. The diamond is graded M in colour, and has a clarity grade of SI2. The diamond's GIA grading report number is 6192749739, which will detail further its specifications and measurements, and will also come with the purchase of the stone. This Marquise diamond is 1.18 carat in weight, and comes with Good polish and Good symmetry, as verified from an independent gemological laboratory. The diamond is graded M in colour, and has a clarity grade of SI2. The diamond's GIA grading report number is 7253006744, which will detail further its specifications and measurements, and will also come with the purchase of the stone. AUD 8,944 Excl. Duties / Taxes. This Marquise diamond is 2.33 carat in weight, and comes with Good polish and Good symmetry, as verified from an independent gemological laboratory. The diamond is graded M in colour, and has a clarity grade of SI2. The diamond's GIA grading report number is 2195605379, which will detail further its specifications and measurements, and will also come with the purchase of the stone. AUD 6,174 Excl. Duties / Taxes. This Marquise diamond is 1.83 carat in weight, and comes with Good polish and Very Good symmetry, as verified from an independent gemological laboratory. The diamond is graded M in colour, and has a clarity grade of SI2. The diamond's GIA grading report number is 5161030681, which will detail further its specifications and measurements, and will also come with the purchase of the stone. AUD 2,635 Excl. Duties / Taxes. This Marquise diamond is 1.09 carat in weight, and comes with Excellent polish and Very Good symmetry, as verified from an independent gemological laboratory. The diamond is graded M in colour, and has a clarity grade of SI1. The diamond's GIA grading report number is 7318345065, which will detail further its specifications and measurements, and will also come with the purchase of the stone. AUD 1,852 Excl. Duties / Taxes. This Marquise diamond is 0.72 carat in weight, and comes with Very Good polish and Very Good symmetry, as verified from an independent gemological laboratory. The diamond is graded M in colour, and has a clarity grade of VVS1. The diamond's GIA grading report number is 7296154667, which will detail further its specifications and measurements, and will also come with the purchase of the stone. AUD 3,516 Excl. Duties / Taxes. 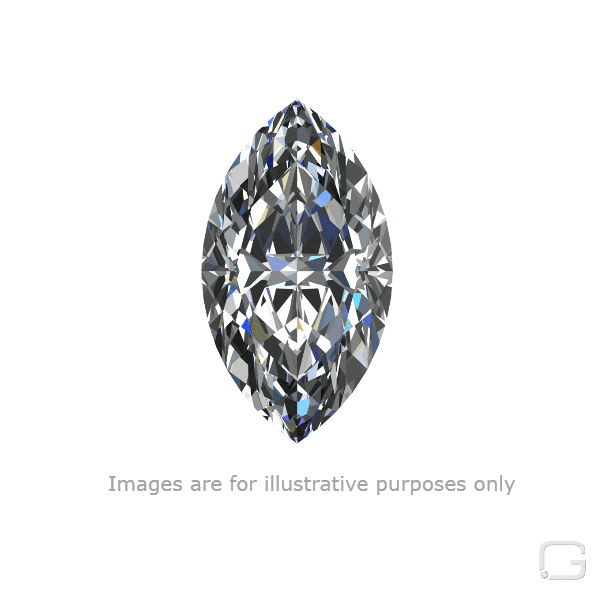 This Marquise diamond is 1.25 carat in weight, and comes with Good polish and Good symmetry, as verified from an independent gemological laboratory. The diamond is graded M in colour, and has a clarity grade of SI1. The diamond's GIA grading report number is 2203012370, which will detail further its specifications and measurements, and will also come with the purchase of the stone. This Marquise diamond is 0.74 carat in weight, and comes with Good polish and Good symmetry, as verified from an independent gemological laboratory. The diamond is graded M in colour, and has a clarity grade of VS2. The diamond's GIA grading report number is 6193120235, which will detail further its specifications and measurements, and will also come with the purchase of the stone. AUD 8,060 Excl. Duties / Taxes. This Marquise diamond is 2.08 carat in weight, and comes with Very Good polish and Good symmetry, as verified from an independent gemological laboratory. The diamond is graded M in colour, and has a clarity grade of SI2. The diamond's GIA grading report number is 6204125050, which will detail further its specifications and measurements, and will also come with the purchase of the stone. AUD 8,849 Excl. Duties / Taxes. This Marquise diamond is 2.01 carat in weight, and comes with Excellent polish and Very Good symmetry, as verified from an independent gemological laboratory. The diamond is graded M in colour, and has a clarity grade of SI1. The diamond's GIA grading report number is 2276295621, which will detail further its specifications and measurements, and will also come with the purchase of the stone. AUD 12,199 Excl. Duties / Taxes. This Marquise diamond is 2.56 carat in weight, and comes with Excellent polish and Very Good symmetry, as verified from an independent gemological laboratory. The diamond is graded M in colour, and has a clarity grade of SI1. The diamond's GIA grading report number is 5181671346, which will detail further its specifications and measurements, and will also come with the purchase of the stone. This Marquise diamond is 0.71 carat in weight, and comes with Good polish and Very Good symmetry, as verified from an independent gemological laboratory. The diamond is graded M in colour, and has a clarity grade of SI2. The diamond's IGI grading report number is 229617359, which will detail further its specifications and measurements, and will also come with the purchase of the stone. This Marquise diamond is 1.21 carat in weight, and comes with Very Good polish and Good symmetry, as verified from an independent gemological laboratory. The diamond is graded M in colour, and has a clarity grade of VVS2. The diamond's GIA grading report number is 6312507955, which will detail further its specifications and measurements, and will also come with the purchase of the stone. AUD 3,068 Excl. Duties / Taxes. This Marquise diamond is 1.12 carat in weight, and comes with Good polish and Good symmetry, as verified from an independent gemological laboratory. The diamond is graded M in colour, and has a clarity grade of VS1. The diamond's GIA grading report number is 2205125271, which will detail further its specifications and measurements, and will also come with the purchase of the stone. AUD 3,045 Excl. Duties / Taxes. This Marquise diamond is 1.22 carat in weight, and comes with Good polish and Good symmetry, as verified from an independent gemological laboratory. The diamond is graded M in colour, and has a clarity grade of SI2. The diamond's GIA grading report number is 1206007621, which will detail further its specifications and measurements, and will also come with the purchase of the stone. This Marquise diamond is 2 carat in weight, and comes with Excellent polish and Very Good symmetry, as verified from an independent gemological laboratory. The diamond is graded M in colour, and has a clarity grade of SI1. The diamond's GIA grading report number is 6325283004, which will detail further its specifications and measurements, and will also come with the purchase of the stone. AUD 6,965 Excl. Duties / Taxes. This Marquise diamond is 1.96 carat in weight, and comes with Very Good polish and Good symmetry, as verified from an independent gemological laboratory. The diamond is graded M in colour, and has a clarity grade of VS2. The diamond's GIA grading report number is 2193883488, which will detail further its specifications and measurements, and will also come with the purchase of the stone.